Click on the logo to see who's behind the proposal. Click on an expert's picture to view the bio. Click on specific menu items to check out our unique 4-step framework. First, click on THE ISSUE, where the experts present a common ground of facts. Or click on components of THE ISSUE. Click on the bullets to unfold visuals and further background information. Ask experts your questions. Suggest improvements. Share your stories. Clicking on a specific topic will show you all the associated comments. Create your own topic and add a comment. You can also reply to another citizen's or expert's comment by hitting the reply button. Want to sort comments by oldest, newest or most popular? Select one of the options in the dropdown menu. Visit other users’ profiles by clicking on their photo. You’ll see their site activity and info they choose to share with the community. Cast your vote and be heard. You can change your vote at any time before the deadline. Create or update your profile! Your Profile Page will be created automatically when you join. After you log in, you will see a dropdown menu under your image to update your profile. Share your interests with TheChisel’s community! Take me to the proposals! Do you want to live and work in a thriving American economy? Then explore how we can keep American companies here, attract investment into the US, and boost productivity, wages, and living standards for us all--the American workers. Experts from Urban Institute and American Enterprise Institute have published this proposal. As these organizations do not take institutional positions, this proposal reflects the views of the individual authors. Eric Toder is an Institute Fellow at the Urban Institute and co-director of the Urban-Brookings Tax Policy Center. Dr. Toder’s recent work includes papers on ways of limiting tax expenditures, using a carbon tax to pay for corporate rate cuts, cutting tax preferences to pay for lower tax rates, tax expenditures and the size of government, tax policy and international competitiveness, value added taxes, the home mortgage interest deduction, trends in tax expenditures, the distributional effects of tax expenditures, corporate tax reform, charitable tax incentives, taxation of saving, the tax gap, effects on retirement income of changes in pension coverage and stock prices, employing older workers, and energy tax incentives. 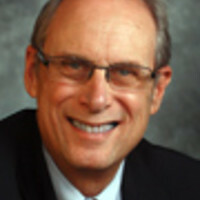 Dr. Toder previously held a number of positions in tax policy offices in the U.S. government and overseas, including service as Deputy Assistant Secretary for Tax Analysis at the U.S. Treasury Department, Director of Research at the Internal Revenue Service, Deputy Assistant Director for Tax Analysis at the Congressional Budget Office, and consultant to the New Zealand Treasury. He received his Ph.D. in economics from the University of Rochester in 1971. Alan D. Viard is a resident scholar at the American Enterprise Institute (AEI), where he studies federal tax and budget policy. Prior to joining AEI, Viard was a senior economist at the Federal Reserve Bank of Dallas and an assistant professor of economics at Ohio State University. He served as a visiting scholar at the US Department of the Treasury’s Office of Tax Analysis, a senior economist at the White House’s Council of Economic Advisers, and a staff economist at the Joint Committee on Taxation of the US Congress. While at AEI, Viard taught public finance at Georgetown University’s Public Policy Institute. Earlier in his career, he was a visiting scholar in Japan at Osaka University’s Institute of Social and Economic Research. A prolific writer, Viard is a frequent contributor to AEI’s “On the Margin” column in Tax Notes and was nominated for Tax Notes’ 2009 Tax Person of the Year. He has testified before Congress, and his work has been featured in a wide range of publications, including Room for Debate in The New York Times, TheAtlantic.com, Bloomberg, NPR’s Planet Money, and The Hill. Viard is the coauthor of “Progressive Consumption Taxation: The X Tax Revisited” (2012) and “The Real Tax Burden: Beyond Dollars and Cents” (2011), and the editor of “Tax Policy Lessons from the 2000s” (2009). A native of Kansas, Viard received his BA in economics from Yale and his PhD in economics from Harvard. He completed the first year of the JD program at the University of Chicago Law School, where he qualified for law review and was awarded the Joseph Henry Beale prize for legal research and writing. These experts crafted the proposal. They want your feedback, questions, and suggestions to improve the proposal. The US corporate income tax is broken. 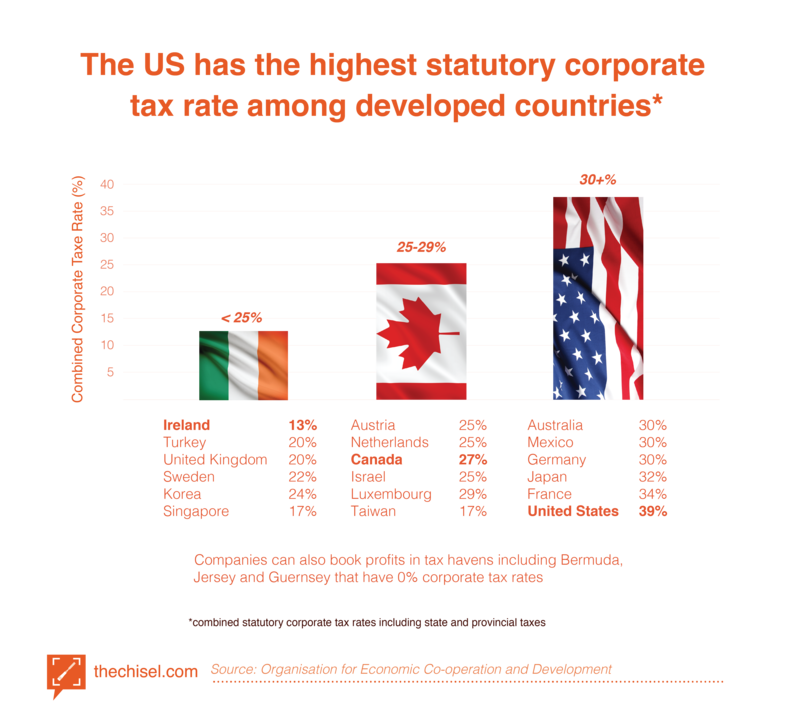 Our tax rate is the highest in the developed world, yet we collect less corporate tax revenue as a share of gross domestic product than many of our trading partners. The tax discourages firms from investing in the US. It also enables multinationals to avoid tax by shifting profits to low-tax countries. The US can impose corporate tax only on income companies earn within our borders and income of companies legally based in the US. US tax law defines a company's residence as the place where its charter was issued. But that legal home may not be where many of the company's investments, employees, customers and shareholders are located. encourages companies to switch from US to foreign charters through "inversions"
And there’s more: Intangible assets such as patents, and brand name, and reputation contribute to profits throughout the world no matter where they are located. 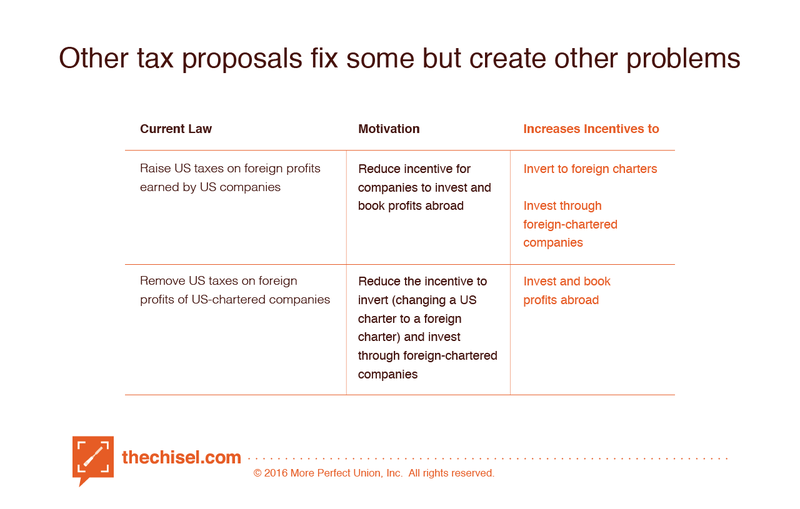 Multinational companies can avoid tax by shifting their intangible assets and their profits to low-tax countries. Double Taxation: Congress adopted the corporate income tax in 1909. Publicly-traded companies and other C corporations1 pay corporate income tax on their profits, which include dividends paid to shareholders. Their shareholders also pay tax (at preferential rates) on dividends1 and capital gains1 from these companies. Pass-through businesses:1 Sole proprietorships and partnerships taxed only at the owner/investor level under the individual income tax and do not pay corporate income tax. New company structures: Congress and the IRS have started moving away from double taxation. Over the past 55 years, they have extended pass-through treatment to more businesses that have the same limited-liability benefits as corporations. 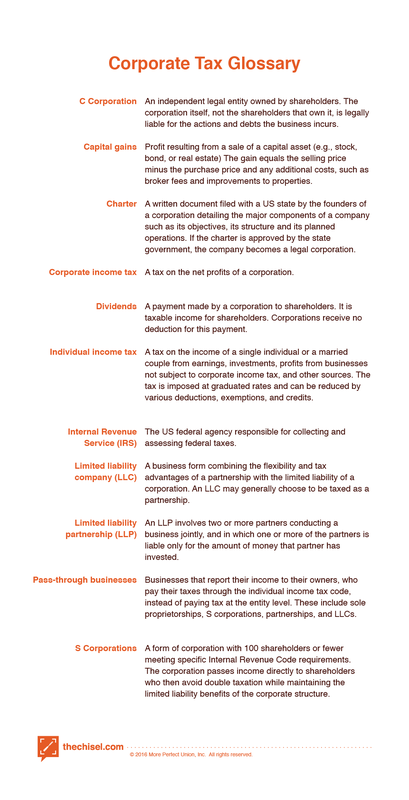 In 1958, Congress allowed small corporations to receive pass-through treatment as S corporations.1 In the 1990s, the IRS allowed limited liability companies (LLCs) and limited liability partnerships (LLPs) to be taxed as partnerships and Treasury enacted “check the box” rules that made it easy for firms that are not publicly traded to choose to be taxed as pass-through businesses. Most publicly-traded companies, however, are still C corporations that are subject to double taxation. Corporate equity-financed investments are taxed at a higher rate than debt-financed and pass-through companies. Corporations financed by debt pay lower effective tax rates than those financed by equity because they can deduct interest expenses. This unequal tax treatment encourages corporations to raise their debt levels, increasing their financial vulnerability. Below are two companies. They are both located in the same city in the US, and they both have the same operating profit, but have different financing. Note: The example assumes that the investment receives no corporate tax preferences and that all after-tax profits are paid out as dividends. Congress is entertaining several tax reform proposals. These proposals would expand some perverse incentives while trying to minimize others. Pages 4-11 describe and critique the current corporate income tax system and the proposals under consideration in Congress. Pages 12-45 describe the details of the authors' proposal. Pages 46-63 present the expected benefits of the proposed changes to the corporate income tax. Toder and Viard present their proposal (and an alternative proposal on international coordination) at a conference co-sponsored by the Tax Policy Center and AEI. Pamela Olson of PricewaterhouseCoopers and Martin A. Sullivan of Tax Analysts comment on the proposal. David Wessel of the Brookings Institution moderates. The authors describe their proposal and why we need it in an op-ed in Market Watch. Upon its release in April 2014, the proposal received widespread media attention. It drew another round of publicity that summer with a wave of corporate inversions sending US companies abroad, prompting the authors to write this article. In this 1995 article, Professor Joseph Dodge, a leading tax expert, advanced a proposal to replace the corporate income tax with shareholder taxation. Although some of the details are different, his proposal followed the same broad approach as this proposal. The OECD tax database provides information on corporate income taxes that are levied in the 34 OECD member countries. The table shows 'basic' (non-targeted) central, sub-central and combined (statutory) corporate income tax rates. Where a progressive (opposed to flat) rate structure applies, the top marginal rate is shown. URBAN INSTITUTE, founded in 1968 to understand the problems facing America’s cities and assess the programs of the War on Poverty, brings decades of objective analysis and expertise to policy debates — to open minds, shape decisions, and offer solutions through economic and social policy research. It is regarded as one of the preeminent think tanks in the US. Along with BROOKINGS INSTITUTE, another preeminent think tank, the Urban Institute sponsors the URBAN-BROOKINGS TAX POLICY CENTER. 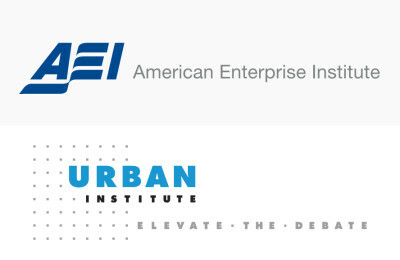 AMERICAN ENTERPRISE INSTITUTE is committed to expanding liberty, increasing individual opportunity and strengthening free enterprise through research and education on government, politics, economics and social welfare. It is regarded as one of the preeminent think tanks in the US. As these organizations do not take institutional positions, this proposal reflects the views of the individual authors. Funding for the research of Toder and Viard has been provided by The Peter G. Peterson Foundation, which focuses on America's fiscal challenges, and The Laura and John Arnold Foundation, which focuses on criminal justice, education, and public accountability. Eric Toder is an Institute Fellow at the Urban Institute and co-director of the Urban-Brookings Tax Policy Center. 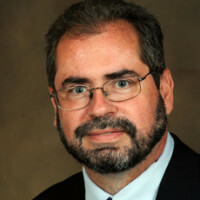 Dr. Toder’s recent work includes papers on ways of limiting tax expenditures, using a carbon tax to pay for corporate rate cuts, cutting tax preferences to pay for lower tax rates, tax expenditures and the size of government, tax policy and international competitiveness, value added taxes, the home mortgage interest deduction, trends in tax expenditures, the distributional effects of tax expenditures, corporate tax reform, charitable tax incentives, taxation of saving, the tax gap, effects on retirement income of changes in pension coverage and stock prices, employing older workers, and energy tax incentives. Dr. Toder previously held a number of positions in tax policy offices in the U.S. government and overseas, including service as Deputy Assistant Secretary for Tax Analysis at the U.S. Treasury Department, Director of Research at the Internal Revenue Service, Deputy Assistant Director for Tax Analysis at the Congressional Budget Office, and consultant to the New Zealand Treasury. He received his Ph.D. in economics from the University of Rochester in 1971. This reduction would occur over a ten-year period (see recommendation #7 below). American shareholders of publicly-traded companies would be taxed on their dividends and capital gains at full ordinary income tax rates, up to 39.6%, rather than today's 20% top capital gains tax rate. This tax increase would be introduced over a ten-year period. The 3.8% net-investment-income tax would also continue to apply to dividends and capital gains. Shareholders would pay tax on their accrued capital gains as the stock rose in value, even if they had not sold their shares. Shareholders would deduct accrued capital losses as the stock fell in value, even if they had not sold their shares. Capital losses could be deducted from current income without limit, carried back to be deducted from the previous two years' income (triggering refunds of taxes paid on past income), or carried forward to be deducted from the next 20 years' income. To prevent double taxation, American shareholders would receive a tax credit for their share of the US income taxes paid by the US firms whose stock they own. However, foreign shareholders, nonprofit organizations, and tax-preferred retirement plans would not receive the credit because they generally don't pay a second level of tax on their dividends. Gains and losses on non-publicly-traded businesses, land, and other assets without established market prices on organized exchanges would continue to be taxed only when the assets are sold and would still receive the preferential capital gains tax rate. However, previously untaxed gains on these assets would be taxable (at the preferential rates) when the owner dies. Because the stock market is volatile, shareholders might have large accrued gains in some years and large accrued losses in other years. To make tax payments less volatile and limit the need for shareholders to sell shares to pay tax in years with big gains, the gains and losses would be smoothed. In each year, 20% of the gain or loss would be taxed or deducted and the other 80% would be placed in a pool of unrecognized gains and losses. In each year, 20% of the balance in the pool, in addition to 20% of the new gains and losses, would be taxed or deducted. So, if a shareholder had a $100 gain one year, $20 would be taxed in that year and $80 would be placed in the pool. In the next year, $16 of the $80 would be taxed (because 20% of the pool balance would be taxed). In the following year, $12.80 of the remaining $64 would be taxed, and so on. Gains and losses would therefore be smoothed over many years. It would not be necessary, however, to keep track of all the past years, as a single number (the pool balance) would be the only information needed. The smoothing would apply to dividends and capital gains and losses on corporate stock, whether or not the stock was sold. The shareholder credit for corporate tax paid at the company level, which was discussed in Recommendation 2, would also be smoothed. Capital gains accruing after a privately held company went public would be taxed as they accrue under the proposal’s general rules (including the credit for corporate taxes paid at the company level and the application of geometric smoothing). However, special rules would apply to the gains that had accrued before the company went public, but that had not yet been taxed because the owners had not sold their ownership stakes. Three-quarters of those previously accrued gains would be exempt from tax and the remaining one-quarter would be included in the owners’ taxable income over a ten-year period. These rules would ensure that companies did not face an undue tax penalty for going public. For further details about this provision, please see pages 23-25 of “A Proposal to Reform the Taxation of Corporate Income” (see full reference below). The first $500 ($1,000 for couples) of dividends and accrued capital gains would be exempt from tax each year. As a result, small shareholders would not have to deal with accrual taxation, the shareholder credit, and the geometric smoothing system. This exemption would remove a large number of shareholders from the capital gains tax system with relatively little revenue loss. Today, non-profit organizations and retirement plans do not pay an explicit tax on their investment income. However, their income from corporate equity bears a 35% tax burden – the corporate income tax collected from the companies whose stock they’re holding. The proposal would reduce that tax burden to 15%. To offset that gain and to make the tax burden more equal across debt and equity holdings, a 15% tax would be imposed on the interest income of non-profit organizations and retirement plans. Once the reform took effect, shareholders of publicly-traded companies would pay tax on accrued annual gains and deduct accrued annual losses. Over a ten-year period, the individual income tax rate on dividends and newly-accrued capital gains would be increased to the ordinary individual income tax rate. Over the same period, the corporate income tax rate would be reduced to 15%. The chart below shows the corporate income tax rate and the top individual income tax rate on dividends and newly-accrued capital gains. The 3.8% net-investment-income tax (not shown below) would also still apply to dividends and capital gains. The chart assumes that the reform is enacted in 2016 and starts to take effect in 2018. The following rules would apply to capital gains that had been accrued before January 1, 2018, but that had not been taxed (because the shares had not been sold). The first $10,000 of these previously accrued gains would not be taxed. Three-quarters of the gains above that threshold would also not be taxed. The remainder – one-quarter of the gains above the threshold amount – would be included in taxable income, spread over the ten-year period from 2018 through 2027. This treatment of previously accrued gains would, on average, roughly approximate the treatment they would have received under previous law, under which they would have been taxed at preferential rates if and when they were realized through the sale of the shares. Other transition rules would also apply to a variety of specialized circumstances. 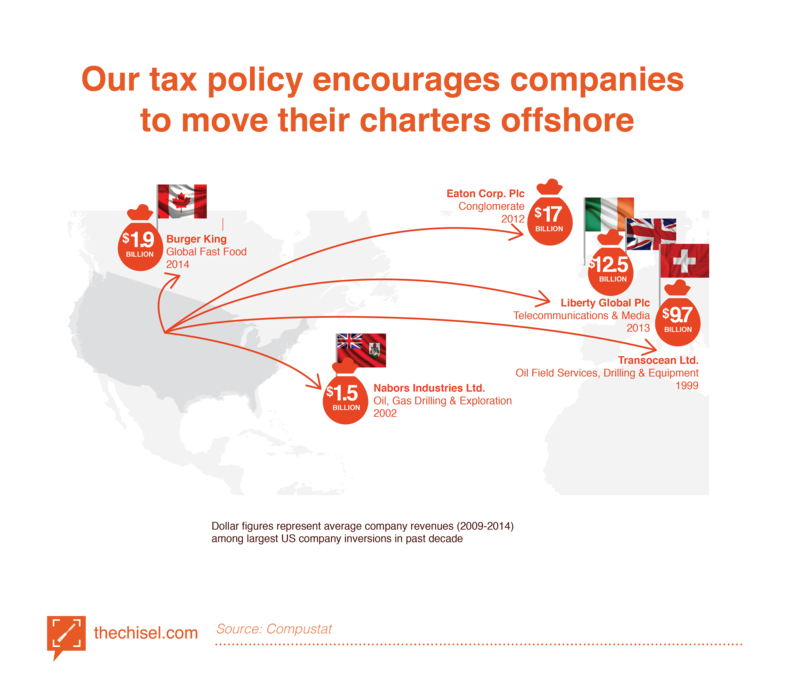 The US tax system would no longer provide significant incentives for companies to move their corporate charters abroad. The shareholder tax would not depend on where the corporation was chartered and the corporate tax would be much lower. The tax incentive for inversions would be greatly diminished. US companies would face little or no tax on overseas income, after applying credit for foreign income against their 15% US tax. With our current tax system, both US and foreign companies are taxed on profits earned in the United States, with less tax, or no tax, on profits earned abroad. The current corporate tax discourages both types of companies from investing in the United States. Reducing the corporate income tax rate to 15% would greatly reduce that effect. Capital would flow into the US, boosting US job creation, productivity, wages and standard of living. By keeping a 15% corporate income tax, we'd ensure that foreign shareholders pay some U.S. tax when they invest here, but the rate would be low enough that it wouldn't drive their money out of our economy. The size of the gain would depend on several factors, including how other countries reacted to the US reform. Because the United States would have a much lower corporate tax rate, both foreign and US companies would book additional profits in the United States rather than abroad. The tax on those additional profits would offset part of the revenue loss from the corporate tax rate cut. State governments with corporate income taxes would also receive additional revenue from taxing those increased profits. 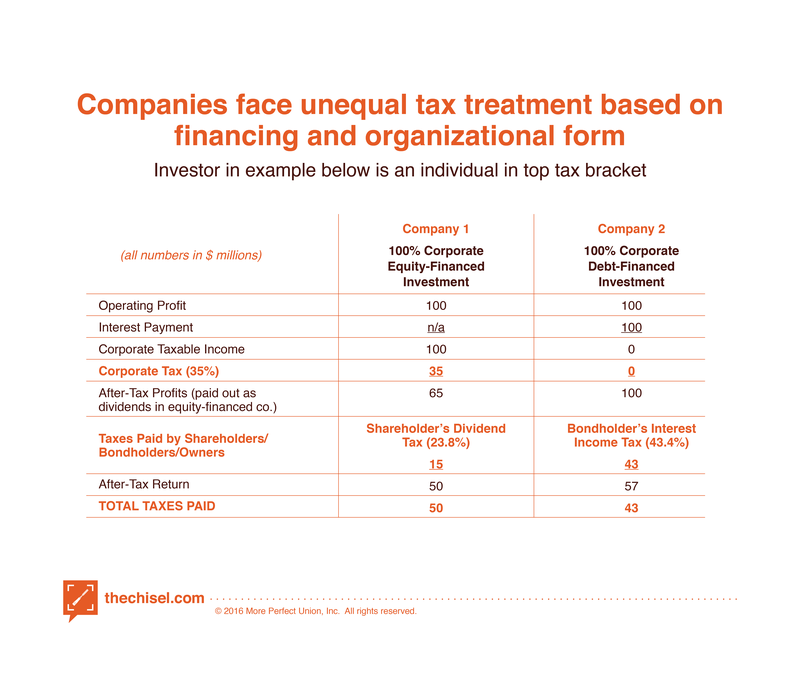 Publicly-traded equity-financed and debt-financed companies would receive equal tax treatment. Companies would be free to choose the best capital structure for their businesses without worrying about tax consequences. Owners of publicly-traded businesses would pay tax on their dividends and accrued capital gains. The corporate income tax would be offset by a tax credit for American shareholders. Owners of non-publicly-traded businesses would continue to pay tax on their share of the business' income. The charts below show the taxes that would be paid by the two companies (described in background point 4) under the reform plan. Although the corporate income tax rate would be much lower than the top individual tax rate (15% compared with 43.4%), corporate profits could not be sheltered from full-rate tax by being reinvested and shareholders delaying selling their stock. Reinvested profits would show up in accrued capital gains, which would be taxed each year at the ordinary income tax rate, even if shareholders held onto their stocks for an extended period. The Urban-Brookings Tax Policy Center estimates that the top 1% of households would pay slightly more taxes than under current law and that all other income groups would pay slightly less. This occurs because the higher shareholder taxes fall almost entirely on upper income individuals with investment income, while a portion of the corporate tax cut will raise workers’ wages by increasing investment in the US, thereby raising capital per worker and labor productivity. The Urban-Brookings Tax Policy Center estimates the plan would be approximately revenue neutral in the long run; it may even raise revenue if the taxes collected on the additional profits that are likely to be booked into the US in response to a reduced corporate tax rate are counted. In discussions over scaling back the corporate tax rate, exacerbating inequality remains my guiding concern; in an era of staggering inequality in income as well as inter-generational wealth across demographics, simply emphasizing 'inefficiency' to the point of fetish is all the more misguided in my humble opinion. After all, according to the Congressional Budget Office, about 80% of corporate income is held by households in the top fifth of the income scale, & about 50% is held by the top-1% . Unless we could replace it with higher taxes on those same households, I'm concerned that scrapping or just lowering the corporate tax rate would be conducive to increasing after-tax income inequality. It doesn't help that beyond the proverbial special interest loophole, folks aggressively look for ways to shelter their income (more precisely, they hire people to do that for them.) As it is, “pass-through” businesses like partnerships & S-corporations – which are not subject to an entity-level corporate tax – now generate roughly 60% of US business income & account for much of the post-1980 rise in the top-1% income share . Relative to traditional business income, pass-through business income is substantially more concentrated among high-earners . There is a line of economic advice I keep in mind – "Don't tax companies in an effort to tax rich people" – but the rise of pass-through businesses raises doubts for me whether repealing a corporate tax would essentially turn a C-corp into a tax haven in itself compared to pass-through companies. [See note 4.] That poses the question whether Toder & Viard also seek to reincentivize businesses to incorporate specifically as C-corps in the United States rather than simply pursuing business through other forms (ie, S-corps). Furthermore, I wonder whether corporations – with decisions subject to agreggate will of corporate governance – are subject to the same kind of incentives to shelter money compared to individual investors. It may very well be that lowering the corporate tax rate in itself doesn't immediately open the floodgates of investment towards expanded production. After all, it is widely reported that America's largest companies collectively continue to hoard over $1 trillion in cash despite a recovering US economy. + The authors claim that their "plan would also address cross-border transactions, effects on state & local governments, & other issues." > How so? + "Shareholders would pay tax on their accrued capital gains as the stock rose in value, even if they had not sold their shares. Shareholders would deduct accrued capital losses as the stock fell in value, even if they had not sold their shares." > Is the deduction necessarily the inverse of a capital gains tax? Does this deduction actually serve to encourage continued investment by safeguarding investors from volatility or is it just socializing losses for investments that would happen regardless? Also, it is just me or is it unclear whether only the year-to-year differential is deductible vs the full value of the stock is deductible? + "American shareholders of publicly-traded companies would be taxed on their dividends & capital gains at full ordinary income tax rates, up to 39.6%, rather than today's 20% top capital gains tax rate. The 3.8% net-investment-income tax would also continue to apply to dividends & capital gains." > Well done! I think this starts to speak to my concern about income inequality. + Toder & Viard do address tax avoidance: "Although there would no longer be a corporate income tax, corporate profits could not be sheltered from tax by being reinvested & shareholders delaying selling their stock. Reinvested profits would show up in accrued capital gains, which would be taxed each year, even if shareholders held onto their stocks for an extended period." I also found compelling the line of reasoning that "corporations financed by debt pay lower effective tax rates than those financed by equity because they can deduct interest expenses. 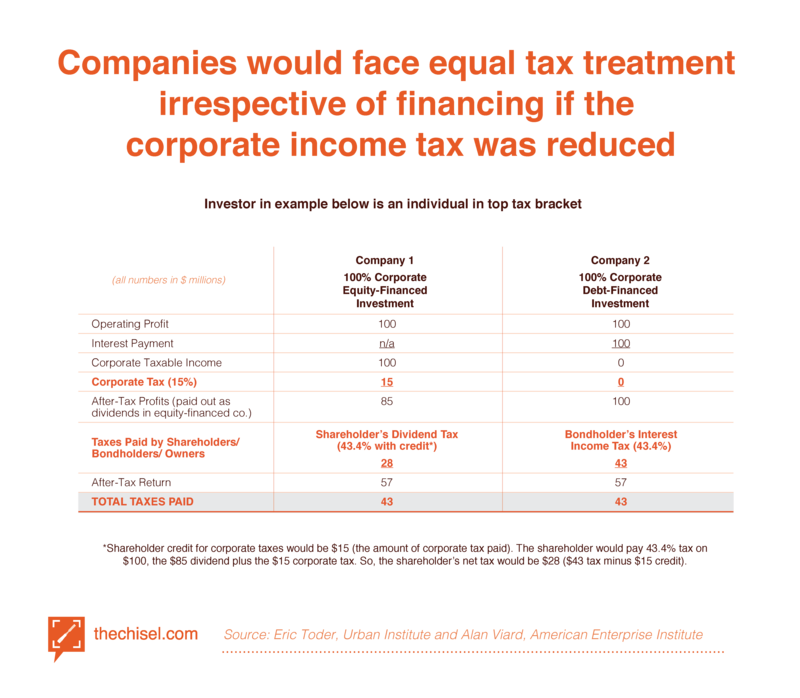 This unequal tax treatment penalizes equity-financed corporations & encourages companies to raise their debt levels, increasing their financial vulnerability." Addressing this reality of traditional corporate finance seems like a step towards a more resilient financial system in general. All in all, it is clear that the US has higher *statutory* corporate tax rates than other developed countries but kudos to Toder & Viard for suggesting alternatives as well as incremental intermediate policy changes towards phasing out the corporate tax rate rather than simply calling for an outright repeal or reduction in that rate. 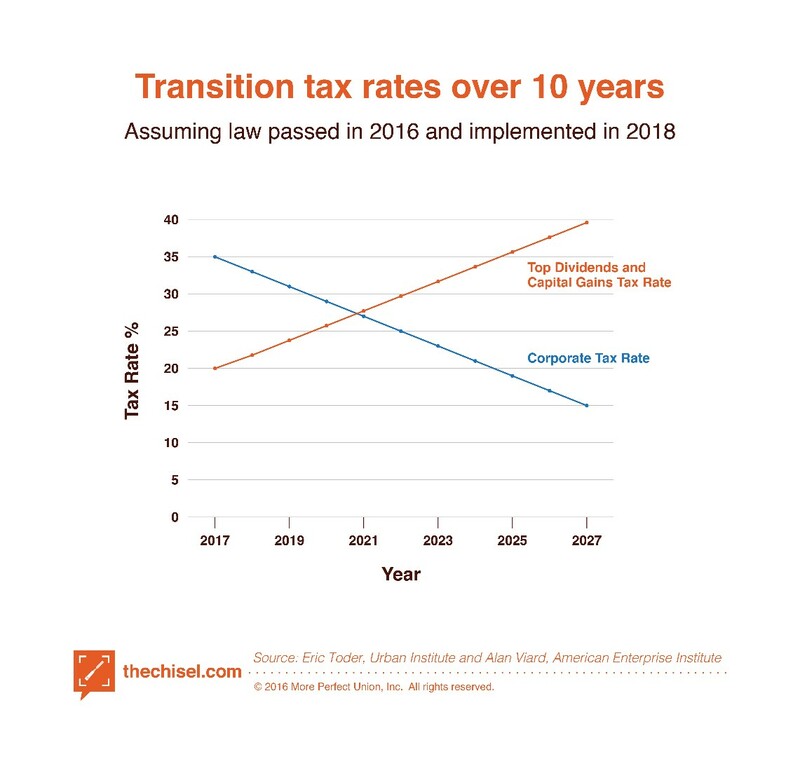 The proposal would reduce the current tax system's disincentives to operating as a C corporation rather than as a pass-through. In practice, there would still be some tax disincentive to being a C corporation because the taxation of accrued gains would likely be somewhat less favorable than the treatment of flow-through businesses. Reducing the corporate tax rate from 35 percent to zero would have to make the United States a vastly more attractive investment location for both domestic and foreign companies. The proposal's treatment of cross-border transactions, state and local governments, and other issues is discussed in our April 2014 Major Surgery report. If accrued gains are taxed, accrued losses must be deducted. There would be no conceivable justification for the adoption of a "Heads the Government Wins, Tails the Taxpayer Loses" tax policy. Given the market's volatility, such a policy would place a heavy effective tax on stock investments and artificially punish risk-taking. If a share rose $20 one year and fell $20 the next year, returning to its original value, how could anyone justify taxing the $20 gain and ignoring the $20 loss? Neutral tax policy absolutely requires symmetrical treatment of gains and losses and we view that as a non-negotiable feature of the proposal. Many thanks for your comment. The proposal would reduce the current tax system's disincentives to operating as a C corporation rather than as a pass-through. In practice, there would still be some tax disincentive to being a C corporation because the taxation of accrued gains would likely be somewhat less favorable than the treatment of flow-through businesses. Reducing the corporate tax rate from 35 percent to zero would have to make the United States a vastly more attractive investment location for both domestic and foreign companies. The proposal's treatment of cross-border transactions, state and local governments, and other issues is discussed in our April 2014 Major Surgery report. If accrued gains are taxed, accrued losses must be deducted. There would be no conceivable justification for the adoption of a "Heads the Government Wins, Tails the Taxpayer Loses" tax policy. Given the market's volatility, such a policy would place a heavy effective tax on stock investments and artificially punish risk-taking. If a share rose $20 one year and fell $20 the next year, returning to its original value, how could anyone justify taxing the $20 gain and ignoring the $20 loss? Neutral tax policy absolutely requires symmetrical treatment of gains and losses and we view that as a non-negotiable feature of the proposal. This proposal is now closed. Please don’t forget to check out our other proposals to voice your opinion. Your voice has been heard. Thank you for voting on this proposal. Your opinion is valued and we encourage you to check out other proposals on issues important to you. Copyright © 2014 - 2019 More Perfect Union, Inc. All rights reserved.